We teach from the airport south to Hurstville and Oatley, to Blakehurst, and across the George’s River to include the Sutherland Shire peninsular across to Sutherland. At Tanya’s Tadpoles, we offer private swimming lessons for babies, children and even adults in your home pool. Our programs include infant aquatics, learn-to-swim, and stroke development up to junior squad level, but private swimming classes can be arranged for any age group. 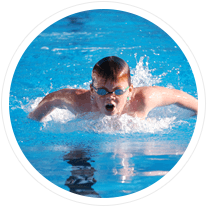 Our swimming lessons in St George and the Sutherland Shire are conducted by our friendly AustSwim or Swim Australia accredited instructors in the convenience of your home pool. We believe comfort and familiarity is essential to building confidence and developing swimming efficiency, especially for little ones. 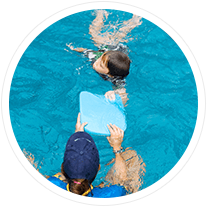 Our lessons include water safety and are designed to be fun for all involved. In a place like St George and the Sutherland Shire where beaches and watery spots are a way of life, it’s important to have great swimming skills so you can have fun in the water safely. Book your private swimming lessons in the Sutherland Shire today! All ages and abilities. Never too old to learn!